Angel E. Alvarez is a political science professor and a political and policy advisor. He has been a Head of Department of Political Theory and Director of the Institute for Political Studies of the Faculty of Law and Political Sciences at the Central University of Venezuela and Head of the Department of Political Theory at the Catholic University Andres Bello in Caracas, Venezuela. 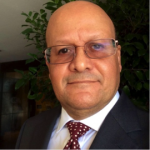 Professor Alvarez holds a Master of Art and a Ph.D. from the University of Notre Dame, USA He is the author of five books and dozens of articles on Venezuelan and Latin American politics, public policy analysis, and comparative regulatory policies.